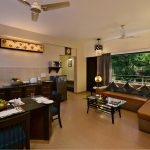 Suites are spacious, comfortable and beautifully decorated providing the best experience when in Goa. Jr. suites comprise a living area of about 230 sq ft with a bedroom and dining room. 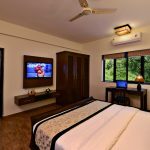 The Jr. suite has a king size bed and is quipped with other facilities like 40″color TV in bedroom & living area with multi-channel cable, Tea/Coffee maker, High-Speed Internet Access, Kitchenette and well-maintained bathroom with a complete range of toiletries. 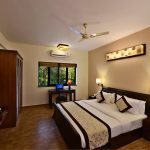 Suites are spacious, comfortable and beautifully decorated providing the best experience in Goa.